There was a time in high school when I hadn’t drank the Apple Kool-Aid yet and still rocked my Android phone. I liked being able to pick the phone I wanted based on features, and not just by whatever one manufacturer decided to implement that year. I owned three droids over the course of high school, but by college decided to take the plunge into the Apple ecosystem with a new iPhone. But I have to admit, when I owned my Motorola Droid X and my HTC Droid DNA, I was always captivated by Apple’s new releases. For a steady few generations of new iPhones, I was glued to the live Apple keynotes streaming from WWDC. I was caught up in their golden age of innovation, eagerly waiting to hear about the latest and greatest features being offered. They didn’t just build beautiful products, but a sophisticated pipeline and unmatched user experience. Apple’s attention to detail in every aspect of its design separated Apple as the clear leader in the industry, and even I knew this as an Android user. Apple was lauded as innovative beyond compare in the technology space. But what Apple also did was create an ecosystem for itself with users being able to interact with all kinds of content seamlessly via services like iTunes and the App Store. As these new features were announced, Apple fans far and wide congregated on the Internet to speculate and share leaked information about new developments. These leaks could range from details of new patents filed by Apple or low-quality photos of iPhone components on the production line in Taiwan. But for Apple’s next anticipated releases, a next-gen iPhone SE and the iPhone 8, there’s not much buzz at all. And as one Forbes article put’s it, the “disappointing iPhone 8 leaks are key to Apple’s boring success.” In its post-Jobs era, Apple simply hasn’t innovated on the scale of a few years ago. But with steady profit increases, Apple has been able to present minimal iterations on its classic products while realizing steady gains based solely on brand power and network effects. While Apple has nestled into its more luxury technology product identity, Android adoption has exploded in recent years (particularly since the death of Steve Jobs in 2007), and due in part to low-cost Android phone offerings in emerging international markets. But with so much of its revenues teetering on the success of its line of iPhones, maybe now is the time for the iPhone to play catch-up with some Android features that it’s been lacking for years. With the most current leaks suggesting almost no unprecedented features for the smartphone industry, onlookers are left wondering about the future of the company’s innovation, at least in the short-run. I’m left assuming their conservative moves are a way to allow other companies like Samsung to burn out with risky new offerings (no pun intended). One feature expected in the next iPhone is an edge-to-edge curved glass display, meaning the complete removal of the home button. With the removal of the home button comes the removal of Touch ID as we know it, with some reports suggesting an acoustic analyzer under the glass to detect fingerprint patterns anywhere on the screen will replace it, and another report claiming a 3D laser facial recognition scanner will do the job. This seems more innovative on paper than in practice considering one technology is forcing the replacement of another. In some respects, it seems like one step forward, one step back. I feel compelled to note that, despite its obvious… shortcomings, Samsung’s Galaxy Note 7 actually featured a similar facial scanner that was designed with an even more sophisticated technology than that speculated in the new iPhone, specifically in regards to its ability to detect a person’s face even when wearing contact lens or (sun)glasses. The iPhone 8 is also reported to rock an OLED display, a display technology that’s been in use as far back as 2008 with Nokia’s N85. And even today, an OLED screen would be a notable absence in any high-end Android phone, as the technology is quite standard by now. The one silver lining in all of this is, as a result of Apple catching up to the fragmented offerings its Android counterparts, we can probably expect the above features to become standardized across the smartphone market. I’m looking forward to, if implemented, a stark increase in Qi-enabled chargers in public places and popular restaurants, which would actually be a positive externality for current Android users with Qi-enabled devices. In that same vein, we would also come to expect facial recognition and stunning OLED displays to become standard in all smartphones to come, as Apple’s decisions, even if unprecedented, do tend to set such trends. As someone who used to buy a new smartphone as soon as my Verizon contract would allow me to, I’ve had absolutely no motivation to upgrade from my iPhone 6S to the iPhone 7, let alone seek the “magic” of the iPhone 8. Though I still really enjoy my iPhone, I’ll be looking to other aspects of Apple’s innovation like self-driving cars or even a matured Apple Watch before I hold my breath for truly stunning new iPhone. Greatly appreciated this post considering the iPhone 8 buzz has flown under my radar. I do think we are seeing Facebook’s short-term role as an innovator in the smartphone space as a more subtle approach ~ in effect, gradually setting new expectations for consumers across the entire market (i.e Qi charging technology, wireless headphones, etc). I agree that the iPhone buzz as we know it now may be past its prime particularly considering that the next groundbreaking innovation in smartphone technology could be the hands-free approach that so many consumers (and Pokemon Go fans) are seeking. Great post! I agree completely. I used to get so excited when Apple was releasing a new iPhone, but lately all of their product releases have been super underwhelming. I think Tim Cook is relying too much on the power of the Apple brand and the (now shrinking) switching costs associated with leaving the Apple product portfolio. 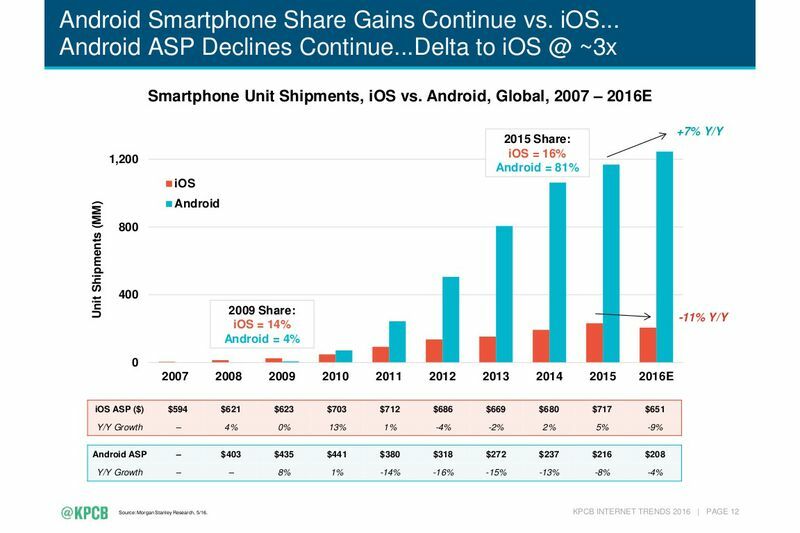 It will be interesting to see if Apple can return to its first mover strategy in the smart phone space or if they’ll submit to being a fast follower. I agree that I’ve been disappointed in Apple’s products recently. Unfortunately, however, they aren’t yet bad enough for me to switch out (or I should say Android products aren’t yet that much better), but I do sense the time is coming soon. I’m just locked into the ecosystem, and it will be a pain to switch out. Good summary of Apple’s current situation. I think that in recent years we’ve come to realize just how dependent Apple was on Steve Jobs for its innovation. In my opinion, since Tim Cook took over, Apple has transitioned to a mature company focused less on being innovative than using and improving on the innovations of others. While I think they can get away with this for now due to how embedded they are in consumers’ lives, people will begin moving away from Apple once they can justify the switching costs (which are still quite high). Great perspective on the new features! I personally think wireless charging could be quite valuable for users, but I definitely empathize with your disappointment in general with Apple’s latest iterations of the iPhone. I also really identify with your closing paragraph in that I’ve had the 5S for four years now, and am holding out as long as possible in hopes of a new and innovative iPhone. I wish I could just keep my 5S for another four years, but in all likelihood it will die well before that, as most apple products tend to last no more than a few years. This is a great post. After dropping my phone at an Eagles game a year and a half ago, I was forced to replace my iPhone 6 with my brother’s old iPhone 5s. While initially I was disappointed going back a generation, I eventually realized that besides the size of the screen and the occasional slow down in processing, I wasn’t missing out on anything. I still am using my 5s and am not even in that much of a hurry to get any of the newer generation iPhones. Every time one of my friends gets an Android (which, admittedly, is rare), every single one says how happy they are having their phone instead of another iPhone. I always tell myself my next phone will be an Android but I know I’m a sheep and will probably end up getting another iPhone when the time finally comes. I don’t want to be the guy with green text messages! Great discussion about Apple’s recent success [or failures]. I can definitely resonate with you about your initial reluctancy to switch over from a Android to an iPhone in the sense that I was set on keeping my Blackberry forever and definitely did not want to switch into the Apple world. Of course like you, I eventually gave in as well being that there was so much excitement about the new features that came with each new generation of iPhones. But I definitely have not heard as much buzz about the new iPhones in the recent past, which is something that Apple really needs to work on. Really interesting post. The saddest part is that the iPhone 8 was supposed to be a groundbreaking new innovation. I unfortunately upgraded to the iPhone 7 during the week after its launch–purely because my mophie charging case had decimated the battery of my 6 and it was (essentially) free to upgrade during that first week. A day after I upgraded, I saw a brilliant article that the iPhone 7 was sort of intended to be underwhelming. It has so many pain points–namely the lack of the headphone jack and physical home button, with not many noticeable improvements. According to that article, the 7 was meant to be an in-between model to get those pain points out of the way. This way, when the 8 comes out, people won’t get caught up on the pain points and can focus on the incredible innovations. What your post pointed out is that those “incredible” innovations with the 8 actually aren’t all that incredible. I’m still hoping Apple has something truly exciting in store for us. Regardless, I have a feeling the iPhone 8 will be a major success. While the curved screen and wireless charging aren’t groundbreaking, they’re new to iPhone users, and customers will no longer dread the headphone jack and home button pain points.